Here’s a service provider that some of you might have come across recently – webnames.co.zw. The company is offering online domain registration with local domains going for $5 a year. This is the same service that startup name.co.zw, has been offering along with a domain checker facility. The two competing services provide a solution to the huge problem of offline domain registration, a crucial service that even Google is now involved in. 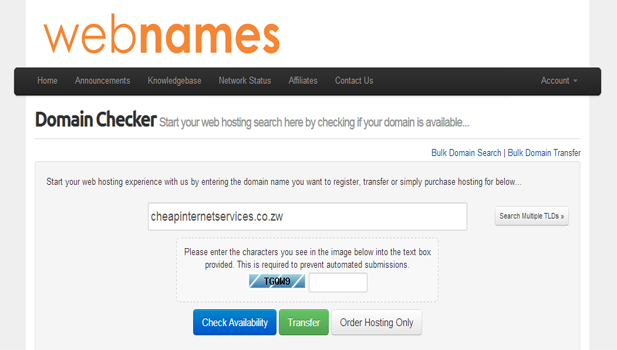 At $5, webnames.co.zw is currently offering the cheapest price to register a co.zw domain. However this price only applies to individuals registering locally as the system ties your IP address to the billing category. webnames.co.zw has the option to try other TLDs which would be a plus for someone keen on that .consulting or .club domain. Other products and features from webnames.co.zw include the transfer of domains, web hosting (complete with varying packages that run from bronze to silver) and email hosting. All of this can be paid for online thanks to an integration with payment gateway Pay4App. With a competitive price and key web related services under one roof it looks like webnames.co.zw is going to give guys like name.co.zw a good run for their money. No problem Farai, as for the interface we are working on improving it. Congrats Webnames, let’s continue to build a better Internet ecosystem for Zimbabwe. Thanks Farai for exposing that. The site webnames.co.zw has been disabled. Please contact support. Will I trust you with my domains and websites, who disabledn the site. Could you please explain to me otherwise all of us will loose confidence ‘or already have’ in you. I bought a domain from them to test it out , next day i see their website is disabled, r they not supposed to be the “disablers” its been over a week and my domain is still not registered, ontop of that they are not respondin to my emails. you destroyn the credibilty that zim wants to have with online purchases not just for you but the industry as a whole, now i would have rather gone and paid hard cash wherever and i would have my domain by now. I don’t care what reason(s) they have. For a company that purport to offer hosting, this is unacceptable. They say they are ZISPA accredited but ZISPA says it doesn’t know who the heck they are. Clearly these guys will lie through their teeth just to get your money and then run away with it. apologies for the downtime we had some issues with some of our providers and it really affected the entire system but we are now back on our feet. Could you please email accounts@webnames.co.zw and we can work something out for you. I fell into the trap and registered a few domains with these guys last week. Has anyone been able to retrieve their domains? Please help! I contacted your accounts on the 14th of October, the day you asked me to. It is now the 26th and I have still had no response. Please may I have a resolution to this immediately! Please may I have my money back. That is all I ask. And I will not be doing business with webnames in a hurry. I have had to climb the highest mountains to simply get a response from you guys and after 8 days of “registering” my domains, they are not registered and nobody will care to respond to your support tickets. You guys are really giving the industry a BAD name! As you can see, I have still not had any resolution on this issue. Guys, I have been highly disappointed in your service and in the fact that despite numerous bits of correspondence after a month, I still have not received my refund for domains that should have been registered and never were. Now I get a message that you have closed my ticket because you have not heard from me in 48 hours and yet I sent the last message to you. Please may my refund be effected immediately so that both I and you can move on with our lives. Please may this be done as a matter of urgency! Please may Webnames give me my refund for the domains that were never registered. It has now been two whole months since I have been asking for this refund. I was promised it and up to now, no-one has contacted me. Guys, please may you sort this out so that we can all move forward. Hi Taps, we have responded to your questions as requested and for any queries you may follow that thread with us so that we understand where exactly to shed more light on or alternatively give us your mobile contacts and we can call and discuss. Taps, for your own sake and that of those you will do business with, DO NOT use Webnames! I repeat, DO NOT use Webnames! I fell into the trap and wish I had spoken to people like you are doing. I have come come across a few people in the Web Design industry who have used them and regret that to this day. You will follow from this train of conversation that I registered domains with them in October of last year and they ripped me off. Since then I have been contacting them via email, posting my complaints on their Facebook page and also here on TechZim as well as via Support Tickets on their website. It is now 6 months later and they have not had the decency to refund me. They keep promising to do so “soon” and then closing my support tickets and not bothering to communicate until and unless I lodge a complaint. Sometimes they simply ignore me. That is simply not the way to do business. You have been warned! My name is Munya and i am willing to understand this issue so we can settle it the best way possible, i will take time to contact you during our local business hours so we may discuss this grievance and hopefully we can conclusively agree on how to make a head way from all this barrage. Hi Munya. It is now a week later and you continue to prove my point. Do you guys enjoy the fact that I have been complaining endlessly for 6 months without resolution? I paid for a service which I never received and you guys are happy to just continue in silence, despite my very many appeals! I scratch my head at this? I can honestly say that I have never seen such! Please check your email as we failed to get through to your contacts, i mailed you the very same day. You can contact us on +263773192533 or +263775787180 and we will assist you there.